Step into Summer with the Stylish Brian James Shoes! I received a a pair of Brian James Gabrielle wedge sandals for this review. I was not financially compensated for this post . My opinions are my own and not by any means influenced by any other part. You might remember my review for the super cute and stylish Brian James short boots a few months ago? Brian James in the women’s shoes line of Angela Edgeworth who is also the creator of one of my favorite kid’s shoes : Pediped. The Brian James brand offers a great selection of trendy shoes for women and their catalog is filled with different styles that range from boots to flats and just in time for summer, they have added a must have selection of wedges sandals that are to die for! The Gabrielle wedge sandals feature a 3.5 inch stacked wedge with a modern feel. The Gabrielle wedge sandals from Brian James have been embellished all across the front of the sandals to enhance the look and cut of the sandals. The Gabrielle wedge sandals also feature a Velcro closure which makes the sandals very easy to put on and take off…You will also find a B on the ankle strap closure that stands for the Brian James logo and adds a classy touch to the shoes. The Velcro closure also allows you to easily control the adjustability on the sandals. While the sandals are higher that what I usually wear (3.5 inch). They are extremely light weight and comfortable to the point that these sandals are the only dress shoes I brought with me on my trip to the Dominican Republic…Not only because of the comfort factor, but also the sandals are very versatile so they can easily be paired with different clothing styles. I received the black sandals (they are also available in taupe). So the color is not a problem when it comes to wearing them with the different outfits I have packed for my trip, and that includes shorts, dresses, and some leggings. To add to the overall comfort of the shoes, the Brian Adam’s Danielle wedge sandals have a cushioned footbed and leather lining. Inside the box for the Danielle wedge sandals, you will also find a convenient dust bag to help you preserve your sandals. The shoes feel true to size. The Danielle sandals all Brian James shoes, come in overlapping sizes….6.5 – 7 for example…I am usually a size seven so I got a size 37( 6.5-7 ) and my boots fit perfect not tight not loose. If you like a little more space for your toes, you can go the next size up. Just keep in mind that it adds a whole size, not just a ½. My sandals fit perfect! The Brian James‘s Danielle wedge sandals have a retail price is $115.00. 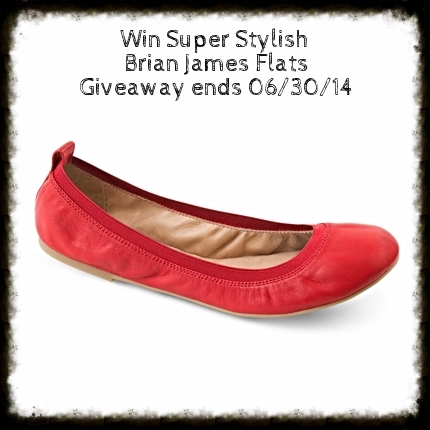 Brian James has teamed up with Born 2 Impress and the Diva Files to offer you the chance to win a free pair of stylish Brian James Flats! Please use the Giveaway Tools form for ALL entries. Except for the initial comment. Please leave comments containing 3 – 4 sentences in order to qualify- Comments like I like this or I want to win will not count! Contest open to the US residents with a valid street address. No PO Boxes please. Winner(s) are selected randomly through the use Giveaway Tools unless otherwise noted and will be announce on the contest closing date. To claim your prize(s), you must contact Born 2 Impress within 48 hours of the contest closing Prize(s) not claimed by (48 hours) will be forfeited and a new winner will be selected. Please provide a valid email address to be informed in case you do win a giveaway. Please note ALL entries are checked for accuracy and will be validated. Clicking on “enter” ensures that your task has been completed. If your task has not been completed, your entry will not be counted and will be considered invalid. If you are chosen as the winner of this contest and you have not completed the task(s) that you claim to complete, a new winner will be randomly chosen. So please be sure that you have completed a task before clicking “enter”thank you for your co-operation. My daughter is getting married in a few weeks and with a hip replacement I can’t wear heels. I would love the ANGIE in gray smoke color to wear under my dress for the wedding. I really like the 3.5 WEDGE PUMP! I love the brown! I’ve seen these shoes for a while and thought they look so comfortable and expensive! They’re a great quality for a great price! I like Gabrielle Sandals in brown. I wish I had these to wear out to dinner or to go shopping with my family. They look dressy, yet comfortable. I’d like to try the Monique Sandal…I’d wear them all over town! I love the LIZA in black. These would have been great on my last cruise. Black sandals are much more dressy than the flip flops I usually wear and are great for a summer dinner. A wonderfully cool and light but classy pair of shoes to pull out of the suitcase! 3.0 charcoal Bootie SKU LD0031. I really like the Lynette shoes, they are just the right height. They would be really nice as dress shoes for a special occasion. The flats are really cute too and definitely more practical. I could use them day to day and they would be really cute with a dress or with jeans. I would have loved the Angie Charcoal Kid Suede for my SIL’s wedding. They look very comfortable to have worn all day and the color is beautiful. I love the Angie in Smoke kid suede. They look so comfortable. I would wear them with skirts or capris over the summer. I love the ANGELIQUE in black. I would of loved these walking around the fair instead of my sandals that rubbed my feet raw. The Angelique snake and taupe shoes are to die for! I wish I had these to wear for everyday shoes. I have been wearing either sneakers or sandals, but these are a little more elegant than sandals, but still casual enough for jeans! I have the perfect shirt to pair these shoes with! I like ANGELIQUE snake and taupe shoes. I could wear these shoes just about anywhere. I likek Angelique snake sand taupe shoes.I think they are pretty and practical. I could wear these shoes just about anywhere. If I had these shoes I would wear them today. That would have been so nice. I really like the 3.0 Bootie. I’ve been wanting them for a while, but they’re not really for this time of year. I would love to get the Lynnette sandals. They look classy but casual at the same time. They would be great for date night with my hubby. I love the Lynnette suede wedge sandal in French Blue Suede.These would be perfect with my new sundress for vacation! I would like the Lynette sandals in black. I would wear these to work. They look so comfortable and versatile. Wow!! They were all lovely and I appreciate the simple elegance of the whole collection. My favorite would be the Monique sandal. It would perfect for the summer and easy to wear them dressed up or down. Being the mother of two handsome and rowdy boys wearing flat yet stylish shoes are essential to keeping up with them. I was impressed with the whole collection. My favorite would be the Monique sandal. I like the classy sophistication of the style. As a mother of two young boys I would love to have have some stylish flat sandals to run around with them this summer. I really like the 3.0 Bootie – Charcoal Leather! I love booties, though I don’t own any. I would love to eventually get some, especially for the Texas fall season! I LOVE THE 3.0 BOOTIE. I WOULD HAVE LOVED TO WEAR THESE WHEN I WENT TO A CONCERT BACK IN MARCH. THEY WOULD HAVE LOOKED GREAT WITH MY FAVORITE JEANS & DENIM JACKET. I would like to get the Liza in taupe. I’d wish to have either pair for home and the slightly rare occasion I get go out. I haven’t had a new pair of sandals in years! They look well made and smartly constructed with the way they’ve slightly hidden the adjustable straps. I really like the Angie ballet flat in red, as I really need a nice, comfy, everyday shoe. I wish that I had the 2.5 wedge bootie in black a few months ago. I had a few engagements and nothing to wear on my feet that both looked good and were acceptable in the weather, which was very cold. East coast winters require many pairs of boots. hehe. I love their selection! I love the Liza on soft blue suede. I wish my wife had a pair of the Brian James™ ballet flats. I would have heard her complaining less about her aching feet when we were on our last vacation. I would like to get the Lynnette sandals. They look classy but casual. I’d like to wear them on a date night with my husband. I would choose the Angie-Noir style in black-since I am six foot tall I never wear heels as I don’t enjoy looking like the jolly green giant 🙂 Thank you for the chance! I like the Ines – Noir Suede shoes in black. These would be nice to wear to church or for having company. Thanks for the chance! I like the cognac flats. very cute for work or for being out on the town. I haven’t heard of this brand till now. i like the Chantel sandal – i love the Gladiator look of them and they look super comfy. I also like the Angie Noir ballet flat – I’m tall so those would be great for me on days i don’t want to tower over everyone. Love these shoes, they look like they are very high quality! J’ aime bien le fait que les souliers portent des noms de femmes. Mes favorites sont les ” Monique ” , la courroie métallique leur donne un petit côté habillée qui convient à toutes heures même pour les sorties chic. I really love the Liza sandals in French blue. They are really cute and I love the color! I wish I had them when I had a suede skirt, similar in color. I outgrew (UGH!) that skirt a year ago. Visited the site and my favorite pair of shoes are definitely the Angie Noir Kid Suede. They would be perfect to wear with a maxi skirt on a summer day. I really like a lot of the shoes on their site actually! I love the LYNNETTE open toes! The are perfect for dressing up that summer outfit when going out or to work! I love the kind of shoe that is comfy and stylish! They come in beautiful colors too! I love their design, if i would have them all it would be great but since only one is required, i would like to try Brian James Chantal design sandals in black because it’s really nice and looks stylish and comfy. I’d love to have the Chantal sandals. They look very comfortable. I would have loved to have these last summer when we went to the boardwalk. I love the 3.5 WEDGE BOOTIE! In black, only because it doesnt come in pink! I have to have heels because I am not even 5 foot tall, and these wedge heels are something that would match pretty much anything I wear! And they are cute cute cute! I also really like the french blue Lynnette. Such a cute shoe and it also looks very comfortable. I would love a pair of Angie-Noir Kid Suede flats. They look very elegant and stylish and I love the color. I wish I had these shoes when my boyfriend and I went out for my birthday dinner. I was looking at all the different styles and I really like the angie charcoal kid suede flats. They look so incredibly comfortable. I just finished college and I am working obtaining a 2nd career at age 31. I think these shoe look professional enough to wear in the office and would keep me comfortable all day long. I can truly say I wish I had them today because me feet are slightly mad at me for wearing the ill fitting flats I have on today. I like the 3.0 Bootie so cute! I like the flats. When I saw the opened-toe sandals, I was not sure if I would like any of the other styles since I find the sandals awkward looking. Boy was I wrong! All the other shoes I like. The booties, flats, and wedges are so stylish. It was a difficult pick, but the 3.5 wedge pump in cocoa washed leather is a winner for me. Whenever I am looking in my closet for a nice pair of brown shoes, I will wish I had these. I love the Lynette sandals , they are gorgeous and look really super comfortable!! I love the 3.5 Wedge Pump in Noir Napa Leather. They are very cute and look really comfortable! I could have used them last weekend at my friends birthday party. I’d love the Liza sandal in Taupe Suede. I really like the Liza sandal! So many nice options. I would love to have the Ines wedges. I have a pair of jeans that need a little bit of a heel and I think these would be ideal. And they look comfortable to work in. The flats are cute. I like both the red and cognac colors. I like the Lynnette and Liza shoes in blue suede, too. I would love the chantal in noir! I am a size 6. Their styles are very classique! The 2.5 Wedge Pump in black. Wish for something like this to go dancing. I like the Lynnette in taupe suede. It looks so comfortable because its a heel, but not too high. It would be perfect for me to wear to work and play! i really like the angie noir. they would be perfect for work. they would also be perfect for casual and look super comfy. I love the angilique flat in snake and taupe! I wish I had them 30 minutes ago when I had to leave my office to walk across campus to pick up some paperwork. I definitely wish i had worn flats today! I love the 3.0 Booties in Charcoal. I wish I had them last winter when it was so chilly. I have some ugly clunky boots, but none that are this cute! I adore the Angie ballet flat! Love all the colors but I’d probably go with the Charcoal Kid Suede, or maybe the Red. Considering that this shoe has a memory foam insole and a rubber outsole, it must be super comfortable. It’s a classic style that belongs in every woman’s shoe wardrobe! I like the GABRIELLE wedges. I need new shoe wardrobe. These will be nice to wear at a party! I really like the Monique sandal it has the snakeskin design and sturdy strap around the ankle that fits me perfectly! I would love to try the Angie Suede in black! These would go with everything. They could be used for dress or casual! OMG! So hard to pick one pair. I’ll go with the Angelique in snake and taupe. I could really use these traveling through the airport or keeping in my bag for when I need a superwoman pair of shoes to hustle in. I love the Angie in the Charcoal Kid Suede. I would be able to wear them to work or to dress up a pair of jeans. I think they’re super cute and look really comfy. I love the Chantal in cognac. I haven’t tried this brand yet. I am funny about shoes. These look they would be perfect for summer. If they have all the support and comfort. I really like the Liza sandals. I prefer flat sandals, but not thongs, and these have a really sophisticated look. The suede is great, too! The Angelique – Snake & Noir would look fantastic with a pair of black skinny jeans. I have a pair of flats like them already, with the elastic around the opening, and they are definitely the most comfy flats I’ve had – no chafing. I also really like the Gabrielle wedges. I don’t usually wear heels, but they look very comfortable – and cute! I also love the french blue Liza sandals from Brian James Shoes. These sandals would be excellent to wear with my new ankle pants and ruffled top that has the same french blue color. I love that color! I love the French-Blue-Suede sandals. They would be a perfect match for the dress I wear to summer weddings. I love the Bootie—Noir-Leather boots. They come in grey and black and like both! I also like the Chantal—Cognac sandals. I love the Angie flats. They would be so nice in black to wear with jeans or dress pants. These would have been so nice to have when flying as they appear to be easy on and off and extremely comfortable. I like the Gabrielle Sandal’s the most, I would choose them. They are trendy enough to wear with pants in the day and with a dress at night. I like the liza noir suede sandals/shoes. They are nice and simple shoes and can go with any outfit. I wish I had them for a birthday party that we went to last month. I like the Liza. I could dress it up or down and they are so cute. Ohhh LOVE this giveaway… thanks for the sweet chance! I adore the Angie ballet flats in cognac color!! I wish I’d had a pair of the Angelique slippers when I was at my last convention. My feet got so tired and blistered from my flats I wore! I would love a pair of the Noir Angeliques for that type of event and more! I’d love to try the Liza sandals. I think it’s hard to find sandals that are both fashionable and comfortable. These ones look like they’d be perfect. I would really like to have the Angelique Snake and Noir Leather shoes. They would work great for me because they are flats. I really like the design. Another product I would love to try is the Lynnette shoes in black. I am not a fan of high heals, but this particular style shoe looks comfortable with a wedge and cushioned footbed. They are stylish and would go great with many different outfits that I own. I wish I had the Gabrielle shoe for tonight. I don’t have any shoes in this color. It would go well with what I’m wearing today for going out to dinner. I love the Smoke kid Suede boot. I love to wear boots, they go great with pants or long dresses and skirts. I live in an are where it is cold most of the time and having boots is essential! So having these suede boots would be Awesome! The angle noir is nice. I would love to have one of the Monique sandals. They’re very chic and I could wear them day or night. I like the ankle cuff!